The Isle of Man Film Festival 2016 is now just a week away! The festival will be on the 8th - 11th September with a whole host of fabulous film fun to look forward to. We have been bringing you all the updates online through our mini podcast series, and the latest of which is now available to listen to by clicking here. In this episode, we chat to festival directors Christy DeHaven and Zoe Guilford about how things are coming together. And, we have an exciting announcement about a big name, and well respected actor joining us on the evening of the 10th September! Just listen to the podcast to find out more! 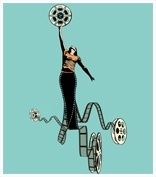 To find out more about the Isle of Man Film Festival, visit the website here. Manx Radio are the proud media partner for the Isle of Man Film Festival 2016.